The Black Teacher Pipeline Is Clogged by Decades of Discrimination. Here’s How to Fix It. For too long, schools have subliminally communicated an insidious message to black students: careers in education are not for you. As student diversity grows, only 20 percent of teachers nationally are of color, and numbers of black educators are swiftly declining in large urban school districts. When students of color graduate from college, less than 20% of them hold degrees in education. Honestly, I’m not surprised: Why would an educated, successful black person choose to enter a profession that has demonstrated systematic racism toward them for more than sixty years? It hasn’t always been this way. Before the landmark decision in Brown v. Board of Education, black teachers taught black students in black schools. There were tens of thousands of black teachers and principals, particularly across the South. But when schools were integrated, a large portion of black educators lost their jobs (an issue which made it to the Supreme Court with Brooks v. Moberly in 1959). As schools became less segregated for children, the teaching profession became more so. This was no accident: school districts systematically excluded black teachers, firing them en masse after integration, setting them up for failure in newly-integrated schools, and, over time, hiring them at slower rates than their white peers. While this history is little-known, it’s not shocking. The same racism that drove slavery and Jim Crow dictated that it would be impossible for black teachers to preside over classrooms that included white students. The thought of a black adult facilitating any child’s learning was, well, unthinkable. Having a teacher of color as a classroom leader matters for all kids. It’s important that the education workforce looks like our nation’s student body, and recent research shows having a same-race teacher improves academic outcomes for black students. Moreover, all students report feeling more academically motivated, more supported, and more cared for by their teachers of color than by their white teachers. Early in my own teaching career, I taught in a small, rural school district. At a meeting for new teachers, I asked the superintendent if she might connect me with other teachers of color in the district, as I had noticed that I was the only one at my school. She laughed uncomfortably, explaining “that people like that” didn’t apply for jobs in the district. Her response haunted me: she didn’t seem concerned by the dearth of diverse educators, and if there were a problem, it certainly wasn’t the district’s fault. Though there were a significant number of students of color in the schools she led, there was no ownership of the fact that teachers of color clearly found the district undesirable, and there was no urgency or sense of responsibility to change that situation. The good news is that when districts make efforts to reduce discrimination and bias in their hiring practices, it works. A teacher desegregation court order enforced in Louisiana in 2010 not only reduced the “representation gap” between black students and black teachers, but also improved academic outcomes for black students. It doesn’t have to take a court order to see results like these. 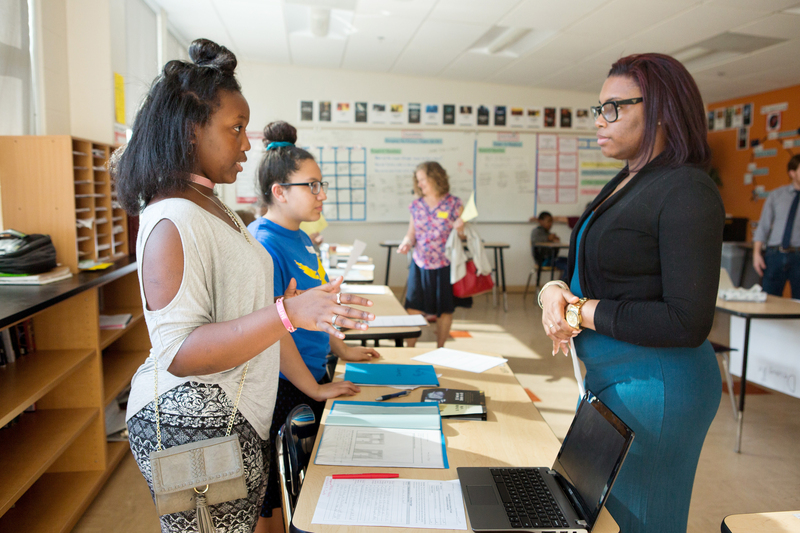 Instead of lamenting the fact that black teachers don’t apply in their districts, or simply wishing that their teaching ranks were more diverse, districts could codify equitable and inclusive hiring practices that emphasize a bias toward teacher diversity. When possible, districts should commit to filling open teaching positions with qualified teachers of color until the racial composition of teachers mirrors the racial composition of students. For equitable and inclusive hiring practices to work, of course, districts need to have diverse teaching applicants. The problem is that barriers to entering the teaching profession disproportionately affect people of color. College is becoming increasingly expensive, and that burden rests more heavily on the shoulders of black and brown students than on their white peers. Further compounding the problem, teacher licensure exams are unfairly biased against potential teachers of color. States might address this problem in a couple of ways — first, by offering full tuition reimbursement or student loan repayment for teachers of color who commit to teaching long-term. States might also consider approving more non-traditional routes to certification, like streamlining the pathway to teaching for paraeducators and other school-level, non-certified staff. Suburban and rural districts, which are less likely to employ teachers of color and more likely to face overall teaching shortages, might consider more drastic measures, like teacher residencies to prepare diverse candidates, pay advances for recent college graduates, commuter subsidies, and leadership roles that recognize and leverage a teacher of color’s expertise. I don’t recall having a single same-race teacher before I went to college, and until then, I never considered the teaching profession as a potential career option. My childhood experiences told me that teachers aren’t black. Presumably, this is the case for many students of color. Commonly mentioned strategies to ameliorate that problem are programs like Educators Rising, which seek to increase the number of “home-grown” teachers by inspiring and developing a passion for teaching at a young age. But for this effort to most effectively engage students of color, teachers of color must be working in schools and in these programs. There are a myriad of reasons that students of color don’t go on to be teachers. The fact that they never had a teacher of color simply should not be one. States and districts have an opportunity to craft a new narrative for the students of color they serve: that teaching is a profession not only open to them, but ideal for them. Education professions offer unparalleled opportunities to positively impact children, and for teachers of color, those opportunities are even more robust. By pairing an emphasis on community service and potential impact with fair hiring practices and financial incentives, states and districts might be able to turn the tide on decades of exclusionary practices toward teachers of color. The pipeline for black teachers is dangerously narrow, clogged with decades of discrimination, bias, and apathy. That pipeline can and must be fixed, though, or states and districts risk negating their progress toward closing achievement gaps and improving learning and life outcomes for all students. Failing to attract teachers of color fails all children. This entry was posted in Equity, Talent and tagged #BWTalksTalent, Black History, equity, Inclusion, Students of Color, teacher pipeline, Teachers of Color on August 27, 2018 by Katrina Boone.